It's time to load up in this Legend class B gas motorhome and head out to your kid's game or your favorite weekend get-a-way spot. 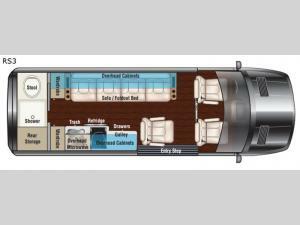 Your kids can choose from two additional captain's chairs or a four-person sofa. There is access to two wardrobes in the main area, and storage in the rear wet bath. If you need to heat up food, or store a few cold refreshments, you have the convenience of a refrigerator, induction cooktop, and convection microwave, plus a sink across from the sofa/foldout bed. Take a look today! With any Legend class B gas motorhome by Midwest Automotive Designs you can enjoy the swivel front driver and passenger chairs providing more seating in the main living area. A Samsung HD LED Smart TV, Wi-Fi prep, and a roof-top solar charging system allows you to enjoy riding down the road or staying inside on a rainy day. The luxury of having leather seating and hand rubbed custom made high gloss wood accents throughout, plus the convenience of deluxe lighting controls and a wet bath, will have you loading up your family every weekend. Choose your favorite floorplan, and get on the road!